San Francisco 49ers wide receiver Randy Moss talks with reporters during a news conference on Wednesday, Jan. 30, 2013, in New Orleans. San Francisco 49ers wide receiver Randy Moss talks with reporters on Thursday, Jan. 31, 2013, in New Orleans. “Now that I’m older … I really do think I’m the greatest receiver to ever play this game.” — Randy Moss, before the Super Bowl in 2013. When Randy Moss proclaimed that he was the greatest receiver ever, he was wearing the same-color uniform as Jerry Rice. Rice, the consensus Greatest Receiver Of All Time™, did not have Moss’s up-and-down career. He was not marred by frequent controversy, nor periods where, by his own admission, he didn’t go all-out on every play. He was Jerry Rice, the guy who finished ahead of Moss1 in the all-time list of receiving yards and atop the receiving touchdowns list, too, well ahead of Moss. But there’s one widely known football expert who makes an excellent case for Moss: Randy Moss. I don’t think numbers stand …  has been a down year for me statistically. was a down year, and Oakland [in 2006] was a down year. I don’t really live on numbers. I really live on impact and what you’re able to do on that field. Moss — despite leading the league with 17 receiving touchdowns as a rookie, holding the all-time single-season receiving TD record (with 23), and posting 10 or more touchdowns in a season nine times in his career — was saying we should ignore his stats. He wanted us, the commentariat, to take stock of some kind of intangible “impact” he had. Moss may be even more right than he knows. Not necessarily about being “the greatest” — that kind of claim depends too much upon subjective interpretations of greatness to be attackable empirically — but if we put aside his receiving numbers and just measure his impact on the game, Moss is pretty much boss. Moreover — in part by virtue of his many controversies — Moss may have created one the greatest (and most important) data sets in the history of football. In his first two years in the NFL, Moss helped Randall Cunningham and Jeff George — both on journeymen’s stints in Minnesota after being relegated to bench duty at their previous clubs — have the best years of their careers. From 2000 to 2004 Moss helped make Daunte Culpepper an All Pro. After Moss’s departure, Culpepper struggled to stay a starter in the NFL, ultimately playing five more years for four different teams, with a combined record of 5-22. In 2005, Moss went to Oakland, where he underperformed for a round-robin of QBs. Then, in 2007, he helped Tom Brady break the all-time passing TD record for New England (at the time, such gaudy passing stats were uncharacteristic for Brady). In 2009 he helped Matt Cassel guide New England to a surprising 11-5 record (and Cassel’s best season to-date) with Brady injured. In 2010, Bill Belichick dumped Moss in a shocking move, after which — despite briefly teaming up with Brett Favre — Moss bounced around on his way out of football, seemingly for good. In 2012, he returned to play for the San Francisco 49ers, where he was relegated largely to role-playing and decoy duty. Whether Moss is at all responsible or not, it’s worth noting that Alex Smith and Colin Kaepernick both had their best statistical seasons with Moss in the rotation that year. If you’re keeping score at home, that’s somewhere between (inarguably) five and (arguably) seven quarterbacks who have all had career years with Moss on the field with them. And indeed, the “Moss effect” is backed up by numbers. Across a whole slew of different statistics, the QBs Moss has worked with have been better with him than without him. The eight QBs with whom Moss has played at least eight games have averaged 48 more yards per game, seen their completion and touchdown percentages rise by an average of 3.7 percentage points and 1.6 percentage points, respectively, ultimately averaging nearly a full yard per pass attempt more in the games with him than without him. One yard per attempt may not sound like much, but that’s about the difference between Peyton Manning (7.7 YPA) and Neil O’Donnell (6.7 YPA). For most players, this type of analysis generally involves a relatively small number of games for comparison, and other factors can come into play one way or another. The number of variables in football are so great, and the degrees of freedom so few, that we could never compute, say, Adjusted Plus/Minus for players. (This is why disentangling quarterback statistics from those of their supporting casts — especially receivers — is so difficult.) 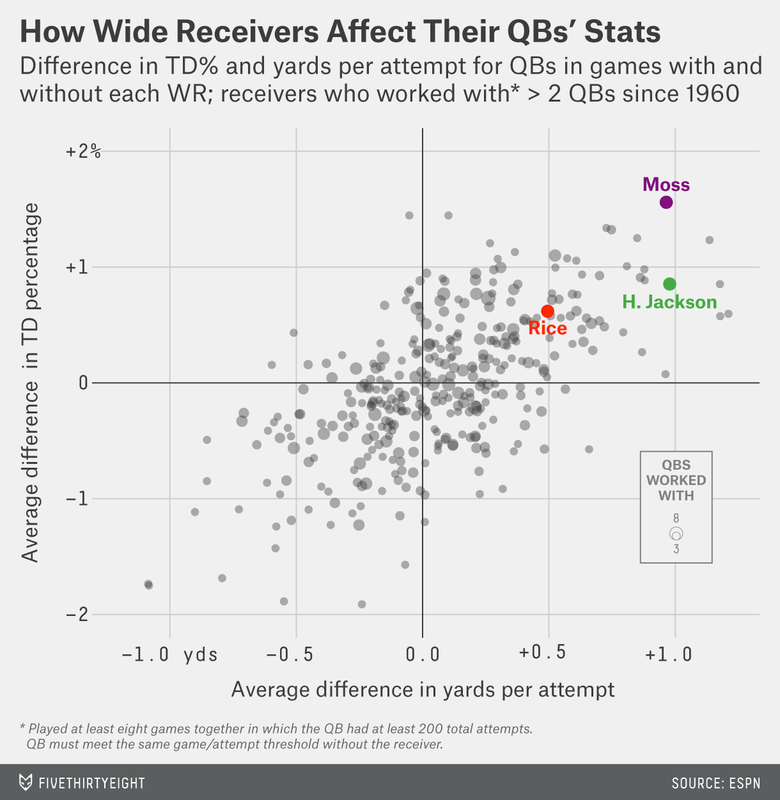 But one way to gain perspective on Moss’s With-Or-Without-You (WOWY) effect is to look at his effect on how efficiently his teams passed the ball — after controlling for how good his quarterbacks were without him — and compare that to the numbers for other receivers in history.3 Only two receivers in NFL history other than Moss4 were associated with a larger uptick in passing efficiency from their quarterbacks — former Denver Broncos teammates Ed McCaffrey and Rod Smith. McCaffrey and Smith were the primary late-career targets for Hall of Fame quarterback John Elway, whose lifetime numbers took a strange arc. As a young QB, Elway enjoyed an elite reputation despite surprisingly pedestrian passing efficiency; only later did he post the quality of statistics we’d normally associate with a passer of his prominence. Smith and McCaffrey were both present for those improved seasons, which boosted their WOWY scores even further because of the advanced age at which Elway produced them. But in terms of individual influence, it’s tricky to disentangle McCaffrey and Smith from each other — and that’s before considering the effect Broncos head coach Mike Shanahan and running back Terrell Davis5 had on Elway’s rehabilitated numbers. Despite the Denver duo’s great WOWY numbers, we still can’t pinpoint which element made the biggest difference to Elway’s statistical upgrade. The bubble sizes correspond to the number of QBs each receiver worked with. The purple is Moss, and the only player “in his neighborhood” with a similar number of QBs is Harold Jackson, who played from the late ’60s to the early ’80s. Jerry Rice also put up impressive numbers with eight quarterbacks (though his career had a lengthy denouement), but his average “impact” was roughly half Moss’s on both axes. It’s possible that some other receiver actually had just as much or more of an impact as Moss, but didn’t have the right combination of good fortune/bad habits to prove himself in such a variety of circumstances. It’s possible. But for any given receiver (even some of the greats), the truth is lost in the informational black hole that is NFL statistical entanglement. At least with Moss, there’s no doubt about his effect — or at least less doubt than with just about anyone else. This is why, ultimately, the sample size is what takes Moss from being a garden-variety outlier to a historically important outlier. It’s great to know that Moss is pretty damn good, but even knowing how good a receiver is (with any degree of certainty) is itself a valuable commodity. But Moss’s greatest contribution may be how his career informs our broader understanding of football: If one man’s ability to run deep and jump high can affect the game so drastically, then the right combination of components, mismatches, or strategies may break the game open at any time. Moss’s career gives us a glimpse at football dynamics that we can usually only speculate about, and it shows us that the game may be even more fascinating and harder to understand than we originally thought. As it turns out, we both have some experience with this question. We can do this by tracking the changes to a quarterback’s Adjusted Net Yards Per Attempt (ANY/A) relative to league average, after accounting for QB aging effects, when he played with a given receiver compared to when he was throwing to different receivers. Among pass-catchers with 5,000 career True Receiving Yards, a statistic that attempts to adjust a player’s raw receiving yards for era and team passing proclivity, with bonuses for receptions and touchdowns. Who was so vital to Denver that he was named the NFL’s Offensive Player of the Year in both 1996 and 1998. The QB also must have played at least eight games without the receiver (but that condition is much more easily met). Note, Montana had 6.9 YPA in Kansas City.